Apparently, to think that I’d get a little time to myself to just chill out, de-stress and get ready for the arrival of Baby Rebel… was like asking for that pot of gold at the end of the rainbow. Or for Dunkin Donuts to start delivering. At 37-weeks, things are still just as full steam ahead as they’ve always been. I’m still out straight, running around and tending to 50-million different things at once. The only problem is: I’m still prepping for baby arrival. Which is why I spent an entire weekend prepping and putting together 16 freezer meals so I can continue to eat healthy for that first stretch after he arrives. Another entire weekend was spent finally getting my husband to do what I’ve been asking him to do for two years now – clean out the sunroom so we have more storage (it was all his junk and 99% of it should have never been brought back in after the remodel, but a different story for another blog…). Now that that has all been done, I get to breathe a little and rest. Right? So close to due date, winter has finally decided to arrive in New England. Since that storm that hit us the first week of November, we have had a fairly easy winter. Some spits of snow, a run of cold weather, fluxing temps… Then Snowmageddon arrived and set it all off. Snow doesn’t shut the state down, or keep me housebound by any means, but it does complicate things to an extent. Which, at this stage of pregnancy, is just annoying. However, aside from all of that, I’m still going strong (and I have taken the time to pamper myself a little by getting my hair “spruced” up for impending mommyhood). My workouts are still good and leave me feeling good. Baby is still dropping more and more, and growing. My only relief from the discomfort and pain has been the steady workouts and yoga. I have found myself over the past few weeks doing more yoga than strength training. Stretching those sore, tender spots. Which is probably good, because I got tagged to join in on a yoga challenge for this month from fellow Sweat Pinker, Lindsay Sanii at She-Mom Fit. The challenge runs from Feb. 2 through March 8, and I plan to do my best to stick with it as long as I can. To get the challenge going, I was asked to fill out a yoga mad-lib (I used to LOVE those back in the day!). When I think about yoga, the first thought that comes to mind is control. Yoga relaxes (verb) me and makes me feel peaceful. That’s why I am SO excited to participate in prAna’s Take The Leap 30 days of Yoga Challenge with Sweat Pink. I plan to stretch my way to a more flexible and balanced 2015! For me, the biggest challenge when it comes to yoga is my lack of flexibility. Taking the Leap with prAna and Sweat Pink is a great way for me to de-stress each day and prepare my body and mind for the birth of my baby. My favorite place to yoga is my dining (noun) because it is so convenient. 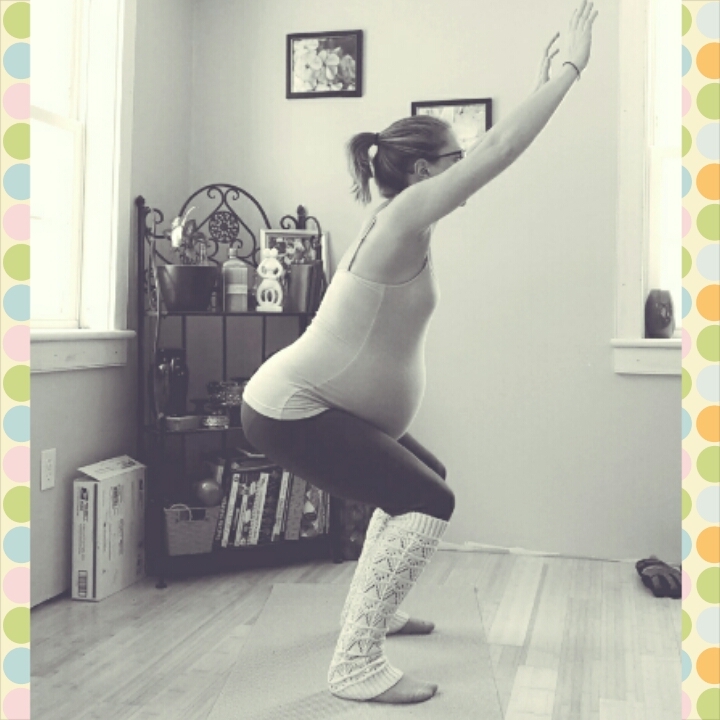 Here’s a photo of me in my very best Prenatal chair pose.